So what could be simpler than falling, right? OK, I get that today’s post may not be as meaningful to those of you who don’t climb. Yes, I’m being literal here. I’m talking about falling. As in: through the air. 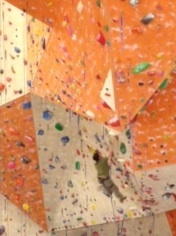 My oldest son, by far the best climber in the family, likes to point out that most people aren’t really afraid of heights. They are afraid of falling from heights. This is a good point. For me, I can’t say I am really afraid of falling per se. 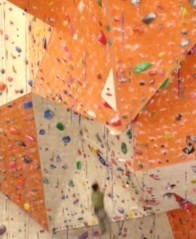 But the fact is: whenever possible, when I am climbing I will avoid falling and call for a “take” instead. 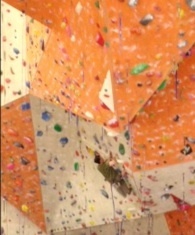 Quick lesson: in “sport climbing,” you are advancing up a rock face or a wall, with a rope attached to you. As you advance, you are clipping your rope into “draws” that you attach to bolts in the rock (if you are climbing outdoors) or that are already bolted in the wall (if you are indoors). You climb to the top of the route, clipping in as you go, and then at the top, you clip into anchors and call for a “take” (as in “take up slack”). Congratulations, you’ve “sent” your route. So up you go, move after move, draw after draw. And what happens if you can’t make the move? Or not. You can always call for a “take” while you’re climbing, rest, and then continue to climb. Which is what I try to do just about every time I climb. So today’s challenge: climb until I fall. I discovered a few interesting things today. The first: when I thought I was going to fall (that is, where I would normally call for a take) I didn’t. If I pushed myself to make a move, there was actually the chance I might make it. So it follows, therefore (big leap of logic here, I know): if I don’t try to make the move there’s no chance I will make it. The second thing I discovered was that falling wasn’t really that scary. What was scary was the moment before I fell. I think what I was really trying to avoid was the welling up of panic right before making an uncertain move–not the fraction of a second in which I am actually falling through the air. And I have to say: ultimately it felt good to commit to a move–rather than backing away from trying to do something because I think I’ve reached my limit. So for you non-climbers, feel free to translate what I am saying here into something that makes sense in your world: what today’s experiment helped me experience is that climbing deliberately sometimes means being willing to take the fall. Oh, and it always helps if you have someone you trust catching you on the other end of the rope! This entry was posted in Uncategorized and tagged fear, risk, simple truth. Bookmark the permalink.